A low-budget US Navy propaganda film intended to drum up recruitment during the Korean War, Flat Top (also known as Eagles Of The Fleet) is a stock story peppered with plenty of grainy stock combat footage. On board an aircraft carrier during the Korean War, Commander Dan Collier (Sterling Hayden) reminisces about his experiences during World War Two. The rest of the film is one long flashback. 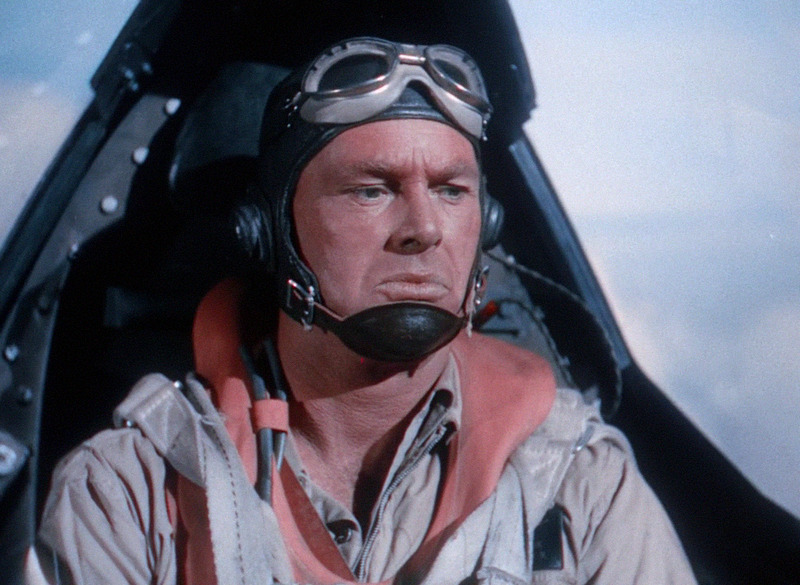 In the Pacific theatre, Collier, a strict disciplinarian, takes command of a group of newly trained pilots. Young and exuberant Barney Smith (Keith Larsen) is immediately grounded by Collier for disobeying orders during a landing. 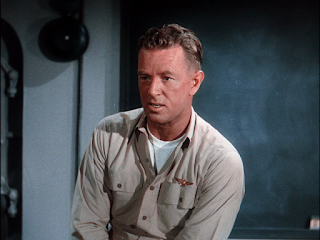 Executive Officer Lieutenant Joe Rodgers (Richard Carlson) tries to reconcile the inexperienced men with the expectations of their new commander. The pilots have to fight long days of boredom at sea. Finally they get into the action and gain experience through raids on the enemy fleet, dogfights with enemy aircraft and finally supporting the Philippines invasion. Throughout, Collier is stingy with his praise, but gradually earns the respect of the men. Directed by Lesley Selander, Flat Top is approximately 45 minutes of original film supplemented by about 40 minutes of footage from World War Two, or at least it feels that way. The actors are edited into the action but it's often painfully evident where the plastic sets stop and the backscreen projections start. Nevertheless, Flat Top was nominated for an editing Academy Award. The film was produced with the full support of the Navy by low-budget specialists Monogram Pictures, and by the standards of that studio this is a top rate production. The USS Princeton was the main on-location set, the colour cinematography is courtesy of Cinecolor, and Sterling Hayden and Richard Carlson provide decent name recognition. But for viewers interested in all the hardware, Selander takes frequent inexcusable shortcuts in cobbling together the action scenes. Characters frequently take off in one aircraft, dogfight in another and land in yet a third type of machine. When a film has to make do with whatever stock footage is available, continuity is an early victim. The plot is the most standard of military dramas, the stern commander whipping green recruits into shape and his second in command having to bridge the gap between experience and enthusiasm. Hayden and Carlson bring the requisite military stiffness and little else to their roles. Selander tries to give some of the other pilots a bit of personality. But other than the grounded Ensign Smith it's a losing battle, and all the young flyers meld into irrelevance, united by the common thread of contriving to disobey Collier's every instruction. Flat Top is certainly flat, and not just at the top.